"Gracie jiu-jitsu" redirects here. For the book by Helio Gracie, see Gracie Jiu-Jitsu (book). Brazilian jiu-jitsu (/dʒuːˈdʒɪtsuː/; Portuguese: [ˈʒiw ˈʒit(i)su], [ˈʒu ˈʒit(i)su], [dʒiˈu dʒit(i)ˈsu]) (BJJ; Portuguese: jiu-jitsu brasileiro) is a martial art and combat sport system that focuses on grappling with particular emphasis on ground fighting. Brazilian Jiu-Jitsu was developed from Kodokan judo ground fighting (newaza) fundamentals that were taught by a number of Japanese individuals including Takeo Yano, Mitsuyo Maeda, Soshihiro Satake, and Isao Okano. Brazilian Jiu-Jitsu eventually came to be its own defined combat sport through the innovations, practices, and adaptation of judo. BJJ is founded on the concept that a smaller, weaker person can successfully defend themselves against a bigger, stronger, heavier opponent. This is done by using technique, leverage, and most notably, taking the fight to the ground, and then applying joint locks and chokeholds to defeat the opponent. BJJ training can be used for sport grappling tournaments and in self-defense situations. Sparring (commonly referred to as "rolling" within the BJJ community) and live drilling play a major role in training and the practitioner's development. BJJ is considered a martial art, a sport, a method for promoting physical fitness and building character, and a way of life. Geo Omori opened the first Jiu-Jitsu / judo school in Brazil in 1909. He taught a number of individuals including Luiz França. Later, Mitsuyo Maeda was one of five of the Kodokan's top groundwork (newaza) experts that judo's founder Kano Jigoro sent overseas to demonstrate and spread his art to the world. Maeda had trained first in sumo as a teenager, and after the interest generated by stories about the success of Kodokan Judo at competitions with other jujutsu schools of the time, became a student of Jigoro Kano. Maeda left Japan in 1904 and visited a number of countries giving "jiu-do" demonstrations and accepting challenges from wrestlers, boxers, savate fighters and various other martial artists before eventually arriving in Brazil on November 14, 1914. Gastão Gracie was a business partner of the American Circus in Belém. In 1916, Italian Argentine circus Queirolo Brothers staged shows there and presented Maeda. In 1917 Carlos Gracie, the eldest son of Gastão Gracie, watched a demonstration by Maeda at the Da Paz Theatre and decided to learn judo. Maeda accepted Carlos as a student and Carlos learned for a few years, eventually passing his knowledge on to his brothers. Gracie's account of the events is that his sibling Hélio Gracie gradually further developed Gracie Jiu-Jitsu as a softer, pragmatic adaptation from judo that focused on ground fighting, since he was unable to perform many judo moves that require direct opposition to an opponent's strength. Although the Gracie family is typically recognized as the main family to first develop Brazilian Jiu-Jitsu as we know it today, there was also another prominent lineage derived from Maeda via another Brazilian disciple, Luiz França. This lineage had been represented particularly by Oswaldo Fadda. Fadda and his students were famous for the influential use of footlocks and the lineage still survives through Fadda's links in teams such as Nova União and Grappling Fight Team. The name "Jiu-Jitsu" derives from an older romanization of its original spelling in the West (is still in common use); the modern Hepburn romanization of 柔術 is "jūjutsu". Outside Japan, however, this distinction was noted even less. Thus, when Maeda and Satake arrived in Brazil in 1914, every newspaper announced their art as being "Jiu-Jitsu", despite both men being Kodokan judoka. It was not until 1925 that the Japanese government itself officially mandated that the correct name for the martial art taught in the Japanese public schools should be "judo" rather than "jujutsu". In Brazil, the art is still called "Jiu-Jitsu". When the Gracies went to the United States and spread Jiu-Jitsu, they used the terms "Brazilian Jiu-Jitsu" and "Gracie Jiu-Jitsu" to differentiate from the already present styles using similar-sounding names. In a 1994 interview with Yoshinori Nishi, Hélio Gracie said that he didn't even know the word of judo itself until the sport came in the 1950s to Brazil, because he heard that Mitsuyo Maeda called his style "Jiu-Jitsu". The art is sometimes referred to as Gracie Jiu-Jitsu (GJJ), a name trademarked by Rorion Gracie, but after a legal dispute with his cousin Carley Gracie, his trademark to the name was voided. Other members of the Gracie family often call their style by personalized names, such as Ceaser Gracie Jiu-Jitsu or Renzo Gracie Jiu-Jitsu, and similarly, the Machado family call their style Machado Jiu-Jitsu (MJJ). While each style and its instructors have their own unique aspects, they are all basic variations of Brazilian Jiu-Jitsu. There are currently four major BJJ branches in Brazil: Gracie Humaita, Gracie Barra, Carlson Gracie Jiu-Jitsu and Alliance Jiu Jitsu. Each branch traces its roots back to Mitsuyo Maeda via Donato Pires Dos Reis, and then through the Gracie family or Oswaldo Fadda. Brazilian Jiu-Jitsu has vast similarities to the original Kodokan Judo, widely practiced before Judo became part of the Olympics, and still practiced in lesser extent, as well as some similarity to earlier ryu (schools) Ju-Jitsu. It has also been argued that the Brazilians didn't actually create any fundamental innovations within the art, This has led some practitioners to suggest that Brazilian Jiu-Jitsu should just be called "Jiu-Jitsu" or even Kosen Judo. Certain changes were made to the rules of sport judo after judo was introduced to Brazil. Some of these rule changes sought to enhance it as a spectator sport, and others aimed to improve safety. Several of these rule changes de-emphasised the groundwork aspects of judo, and others have reduced the range of joint locks application. Brazilian Jiu-Jitsu did not follow these changes to judo rules, and this divergence gave BJJ a distinct identity as a grappling art, although it's still recognizably related to judo. Other factors that have contributed towards the stylistic divergence of BJJ from the sport judo include the Gracies' contribution to the art, including emphasis on full-contact fighting. BJJ permits the same techniques that judo allows when taking combat to the ground. These include judo's scoring throws as well as judo's non-scoring techniques that it refers to as "skillful takedowns" (such as the flying armbar). BJJ also allows any and all takedowns used in wrestling, sambo, or any other grappling arts including direct attempts to take down by touching the legs. Spinal locks and cervical locks are not allowed in gi Jiu-Jitsu, amateur MMA, multiple forms of no-gi Jiu-Jitsu, Judo, and other martial arts, due to potential to cause serious bodily injury. BJJ also differs from judo in that it also allows a competitor to drag opponents to the ground. Although early Kodokan judo rules were initially similar to BJJ's, in recent years it has become increasingly restrictive in comparison. BJJ has also become more "sports oriented" in recent years, prohibiting techniques such as slams. In 1972, Carley Gracie moved to the United States to teach Jiu-Jitsu, and in 1978 was followed by Rorion Gracie, who co-founded the Ultimate Fighting Championship (UFC) in 1993. Jiu-Jitsu came to international prominence in martial arts circles when Brazilian Jiu-Jitsu expert Royce Gracie won the first, second and fourth Ultimate Fighting Championships, which at the time were single elimination martial arts tournaments. Royce fought against several larger opponents in other styles, including boxing, shoot-fighting, muay thai, karate, wrestling, and taekwondo. BJJ has since become an elementary aspect of MMA, revealing the importance ground fighting in a fight. Sport BJJ tournaments continue to grow in popularity and have given rise to no-gi submission grappling tournaments, such as the ADCC Submission Wrestling World Championship and NAGA, the North American Grappling Association. Brazilian Jiu-Jitsu focuses on getting an opponent to the ground in order to neutralize possible strength or size advantages through ground fighting techniques and submission holds involving joint-locks and chokeholds. 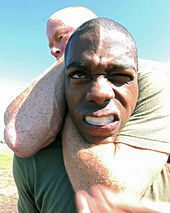 On the ground, physical strength can be offset or enhanced through proper grappling techniques. BJJ employs a wide range of takedown techniques to bring an opponent to the ground such as "pulling guard", for example, which is not used in other combat sports such as Judo or Wrestling. Once the opponent is on the ground, a number of maneuvers (and counter-maneuvers) are available to manipulate the opponent into a suitable position for the application of a submission technique. Achieving a dominant position on the ground is one of the hallmarks of BJJ, which includes effective use of the guard position to defend oneself from bottom (using both submissions and sweeps, with sweeps leading to the possibility of dominant position or an opportunity to pass the guard), and passing the guard to dominate from top position with side control, mount, and back mount positions. This system of maneuvering and manipulation can be likened to a form of kinetic or physical chess when executed by two experienced practitioners. A submission hold in BJJ is often assimilated to the equivalent of "checkmate", where the opponent is left with no other option but to tap or get injured or choked. 'The classical jujutsu of old Japan appeared to have no common strategy to guide a combatant over the course of a fight. Indeed, this was one of Kano's most fundamental and perceptive criticisms of the classical program.' Maeda not only taught the art of judo to Carlos Gracie, but also taught a particular philosophy about the nature of combat developed by Kano, and further refined by Maeda based on his worldwide travels competing against fighters skilled in a wide variety of martial arts. The book details Maeda's theory as arguing that physical combat could be broken down into distinct phases, such as the striking phase, the grappling phase, the ground phase, etc. Thus, it was a smart fighter's task to keep the fight located in the phase of combat best suited to his own strengths. Renzo Gracie stated that this was a fundamental influence of the Gracie approach to combat. These strategies were further developed over time by the Gracies and others, and became prominent in contemporary MMA. A demonstration of Brazilian Jiu-Jitsu during a class at Standard BJJ in Rockville, MD. BJJ is mainly differentiated from other martial arts by its greater emphasis on ground fighting. Commonly, striking-based martial arts place hardly to no emphasis on groundwork. BJJ also places little emphasis on standing techniques, such as striking, although it employs takedowns and cross trains with wrestling, judo, and sambo. A Brazilian Jiu-Jitsu instructor gently demonstrates how to tackle an opponent. BJJ focuses on submissions without the use of strikes, while training allows practitioners to practice at full speed and with full strength, resembling the effort used in competition. Training methods include technique drills in which techniques are practiced against a non-resisting partner; isolation sparring (commonly referred to as positional drilling) where only a certain technique or sets of techniques are used; and full sparring where each practitioner tries to submit their opponent through technique. Physical conditioning is also an important aspect of training. The Gracie family lineage descended from Helio Gracie focuses on practical applications of BJJ that apply primarily to self-defense. They will often run development drills in which a person is surrounded by a circle of other students who will attempt to attack the defending student, who in turn must defend themselves using techniques. The student will often be unable to see the aggressor to simulate an attack that they weren't expecting. Once on the ground, the BJJ practitioner strives to take a dominant or controlling position from where to apply submissions. These positions provide different submission or transition options. In side control, the practitioner pins his opponent to the ground from the side of their torso. The top grappler lies across the opponent with weight applied to the opponent's chest. The opponent may be further controlled by pressure on either side of the shoulders and hips from the practitioner's elbows, shoulders, and knees. A wide variety of submissions can be initiated from side control. It is also referred to as the side mount. Additionally, the typical side mount increases opportunity for the top grappler to advance to other dominant positions. This position is often used in MMA as it allows the top fighter to strike whilst overcoming their opponents defence. Variants of the side control include Twister Side Control (popularized by Eddie Bravo), Brazilian Crossbody, kesa gatame, "Wrestler Pin", knee mount, and other positions. In the mount (or full mount) position, the practitioner sits astride the opponent's front torso or chest, controlling the opponent with his bodyweight and hips. In the strongest form of this position, the practitioner works his knees into the opponent's armpits to reduce arm movements and ability to move or counter submission attempts. Full Mount can be used to apply a variety of submissions including armlocks or chokes. When taking the back mount position (often known in Brazilian Jiu-Jitsu as the back grab or attacking the back), the practitioner attaches to the back of the opponent by wrapping his legs around and hooking the opponent's thighs with their heels. or locking in a body triangle by crossing one shin across the waist like a belt then placing the back of the opposing knee over the instep as if finishing a triangle choke. Simultaneously, the upper body is controlled by wrapping the arms around the chest or neck of the opponent. This position is often used to apply chokeholds, as well as arm bars and triangles, and neutralizes an opponent's potential size or strength advantage. When a practitioner is lying on their back on the ground and their opponent is lying on top, with the head over the chest area and controlling the bottom practitioner's arms. As with most top controlling positions in BJJ, the top practitioner applies pressure by bringing their hips downwards towards the ground, generating what is referred to as deadweight. There are several submissions and transitions that are possible from the North South position, most commonly the North South choke, North South kimura, and others. When in the "Guard" position, the practitioner is on their back controlling an opponent with his legs. The bottom practitioner pushes and pulls with the legs or feet to unbalance and limit the movements of his opponent. This position allows practitioners a wide variety of counter-attacks from the bottom position, including submissions and sweeps. The three most common types of guards include the Closed Guard, Half Guard, and Open Guard. In closed guard, the bottom grappler has his legs around the opponent's hips, with ankles closed together to control their opponent. The closed guard can be an effective position. This guard allows many setups for submissions such as jointlocks and chokes, as well as sweeps. In the open guard, the legs are not hooked together and the bottom grappler uses his legs or feet to push or pull their opponent. There are many variations of open guard with distinct names and positioning including the Butterfly Guard, De La Riva Guard, X-Guard, Rubber guard, Spider Guard, Octopus Guard, Lapel Guard, Worm Guard (made popular by Keenan Cornelius) and others. Butterfly guard is when the bottom grappler brings his legs up and feet together against the inner thighs of top opponent. The name is derived from the resulting butterfly wing shape. Butterfly guard increases both space to maneuver and the ability counter the opponent with the shins or arches of the feet against the competitor's inner thighs. In the half guard, one of the top grappler's legs is controlled by the bottom grappler's legs, preventing the top opponent from passing side control or full mount positions. There is also a variant of half guard called "50/50 guard", which consist of each opponent usually in sitting positions with one of their legs hooking the same leg of their opponent in a mirrored fashion. This position is called 50/50 because neither opponent has a distinct advantage, where both sides have the same possibilities of sweeps and attacks. Another variation of the half guard position is the "deep half guard", which involves the bottom grappler positioning themselves underneath their opponent, grabbing the top grappler's thigh. This gives the individual on the bottom the opportunity to sweep their opponent, and end up on a more dominant, top position. This position was popularized by American BJJ Black Belt, Jeff Glover. For a list of list of Brazilian Jiu-Jitsu techniques, see List of Brazilian Jiu-Jitsu techniques. A less common type of submission hold is a compression lock, where the muscle of an opponent is compressed against a hard, large bone (commonly the shin or wrist), causing significant pain to the opponent. These types of locks are not usually allowed in competition due to the high risk of tearing muscle tissue. This type of lock also often hyper-extends the joint in the opposite direction, pulling it apart. Some compression locks include the Achilles lock, Bicep slicer, and Leg slicer (or Calf slicer). While many joint locks are permitted in BJJ, most competitions ban or restrict some or all joint locks that involve the knees, ankles, and spine. The reason for this is that the angles of manipulation required to cause pain are nearly the same as those that would cause serious injury. Joint locks that require a twisting motion of the knee (such as heel hooks or knee bars) are usually banned in competitions because successfully completing the move can frequently result in permanent damage, often requiring surgery. Similarly, joint manipulations of the spine are typically barred due to the inherent danger of crushing or misaligning cervical vertebrae. Leglocks are allowed in varying degrees depending on skill level, with the most prominent BJJ tournaments typically allowing only the straight ankle lock and muscle stretching submissions such as the "banana split" from white through purple belt, with the kneebar, toehold, and calf slicer submissions being permitted at brown and black belt. Most competitions do not allow heel hooks, which are considered to be exceptionally dangerous. However, most joint locks involving the wrist, elbow, shoulder or ankle are permitted as there is a great deal more flexibility in those joints and those locks are usually safe. Joint locks include armbars, kimuras, Americanas, straight-arm lock, omoplata, gogoplata, marceloplata, banana split (or electric chair), twister, Peruvian necktie, Japanese necktie, wrist lock, heel hook, toehold, kneebar, straight ankle lock, and others. Chokes are common forms of submission. In BJJ, the chokes that are used put pressure on the carotid arteries, and may also apply pressure to the nerve baroreceptors in the neck. This kind of choke is very fast acting (if done properly) with victims typically losing consciousness in around 3–5 seconds. In contrast, an air choke (involving constriction of the windpipe) can take up to two minutes, depending on how long the person can hold their breath, and may cause serious damage to the throat. Chokes include rear-naked choke, triangle, bow and arrow choke, sleeve choke (or Ezekiel choke), guillotine, cross collar choke (or X choke), baseball choke, D'Arce, clock choke, Arm triangle choke, north-south choke, crucifix choke, anaconda choke, Gogoplata, loop choke, and others. The Brazilian Jiu-Jitsu practitioner's uniform (commonly referred to using the Japanese terms gi or kimono) is similar to a judogi, but often made of lighter material with tighter cuffs on the pants and jacket. This allows the practitioner to benefit from a closer fit, providing less material for an opponent to manipulate, although there is a significant overlap in the standards that allows for a carefully selected gi to be legal for competition in both styles. Traditionally, to be promoted in Brazilian Jiu-Jitsu, the wearing of the Jiu-Jitsu gi while training is a requirement. Recently with the growing popularity of "no-gi" Brazilian Jiu-Jitsu, the practice of giving out belts to no gi practitioners (e.g., Rolles Gracie awarding Rashad Evans a black belt) has become more common. The Brazilian Jiu-Jitsu ranking system awards a practitioner different colored belts to signify increasing levels of technical knowledge and practical skill. While the system's structure shares its origins with the judo ranking system and the origins of all colored belts, it now contains many of its own unique aspects and themes. Some of these differences are relatively minor, such as the division between youth and adult belts and the stripe/degree system. Others are quite distinct and have become synonymous with the art, such as a marked informality in promotional criteria, including as a focus on a competitive demonstration of skill, and a conservative approach to promotion in general. Traditionally, the concept of competitive skill demonstration as a quickened and earned route of promotion holds true. Some schools have placed a green belt for adults between the white and blue belt ranks due to the long periods between advancement. In addition, the use of a grey belt has been instituted for many children's programs to signal progress between the white and yellow belt rankings. Unlike in some martial arts such as judo and karate, a black belt in Brazilian Jiu-Jitsu commonly takes more than several years to earn, and the rank is generally considered expert level. The amount of time it takes to achieve the rank of black belt varies between the practitioner. Some notable individuals who had previous backgrounds in other martial arts have been promoted directly to black belt rank without going through any intermediate rank. Others have achieved the rank in relatively short timeframes. Outside of exceptions such as these, the average timeframe is around 10 years with a consistent training schedule. However, Ryron Gracie (grandson/grandnephew of founders Hélio and Carlos Gracie) has stated that the average of 10–12 years is longer than necessary, suggesting that the ego of the practitioner often hinders progress, and advancement to black belt should take 7 years. Since its inception in Brazil, Jiu-Jitsu has had different registered federations and tournaments (some organizations illegitimately calling themselves federations). The first Jiu-Jitsu Federation was the Jiu-Jitsu Federation of Guanabara, which has remained a regional federation of Rio de Janeiro, while many others were founded. Among the most prestigious of the many federations are the Sport Jiu Jitsu International Federation (SJJIF), a nonprofit organization with federations and tournaments around the globe with the mission of making Jiu-Jitsu an Olympic sport, and the International Brazilian Jiu-Jitsu Federation, a profit organization that hosts a number of tournaments. While there are numerous local and regional tournaments administered regularly by private individuals and academies, there are two major entities in Jiu-Jitsu circles. First, is the Sport Jiu Jitsu International Federation (SJJIF), a (nonprofit) organization with international federations and tournaments. Second, is the International Brazilian Jiu-Jitsu Federation (IBJJF), an organization that hosts a number of major tournaments worldwide. These include the Pan American Championship, European Championship, and the Mundials. California, New York, and Texas are the three states in the US which host tournaments most frequently. Other promotions within North America, such as Battleground Grappling Championship, American Grappling Federation (AGF), North American BJJ Federation (NABJJF), and North American Grappling Association (NAGA) host tournaments nationwide, but visit these states multiple times within a tournament season. In 2012, the Gracie Worlds introduced a new submission-only format, removing certain judging systems that many interpreted as an outdated scoring system. Rose spoke about this change when she said, "Today's tournaments aren't what my grandfather [Helio Gracie] envisioned. There's so many rules that it takes away from the actual art of Jiu-Jitsu. We don't see many submissions. We see cheating, we see decisions made by a referee. We need to stand together against this and support a submission only kind of revolution." Cheating in Jiu-Jitsu, Rose said, comes in many forms. "[A competitor] will earn a point, then hold for the entire match so they can win with that one little advantage they got at the start," Rose said. "That's not Jiu-Jitsu. That's cheating." This discontent with points-based and advantage-style competition has been echoed throughout the Jiu-Jitsu community, leading to many prominent submission-only style events. At these events, the winner of a match is determined only by submission, and these tournaments at times have no time limit, or are timed with a result of double disqualification if there is no submission victory. This form of tournament have yet to become widespread. Metamoris, a grappling competition event run by Rose's brother Ralek Gracie, has helped advocate this tournament form. Another notable example of a submission-only format is the EBI (Eddie Bravo Invitational), which was the first televised event of its kind, and is now being featured on UFC Fight Pass. Other submission-only events have cropped up all over the world including TUFF invitational and Polaris Pro, and many others. Brazilian Jiu-Jitsu is one of the safest full contact martial arts for practitioners. Its injury rate is around 9.2-38.6 per 1000 athlete exposures. This is lower than in mixed martial arts (236-286 per 1000), boxing (210-420 per 1000), judo (25.3-130.6) and taekwondo (20.5-139.5). It is similar to wrestling, which also uses grappling instead of striking. The few injuries that may be incurred in Brazilian Jiu-Jitsu usually affect the joints and rarely the head. The most common injuries Brazilian Jiu-Jitsu practitioners suffer from are ACL tears in the knees, rotator cuff tears in the shoulders and spinal disc herniations, most commonly in the neck region. They are all repairable via surgery that require an extended rehab period before the athlete can return to BJJ training. Also many athletes suffer from minor injuries, such as elbow and wrist tendonitis, due to overtraining and the grappling nature of the martial art, which can be strenuous and taxing for the joints and the tendons. Due to the use of the head to maintain position and attack in Jiu-Jitsu, the ears can easily be damaged and begin to swell. Without immediate medical treatment, the cartilage in a swollen ear will separate from the perichondrium that supplies its nutrients and will become permanently swollen/deformed (cauliflower ear). The use of wrestling headgear is sometimes used for prevention of this condition. Treatment includes draining the hematoma or surgery. The practice of taking performance-enhancing drugs, including anabolic steroids, is believed to be relatively commonplace among competitors in Jiu-Jitsu tournaments and has sparked letters and public statements by some of Jiu-Jitsu's top competitors, including Comprido and Caio Terra. In response, the IBJJF began testing for performance-enhancing drugs at IBJJF sponsored events, starting with the 2013 Pan American Championship. However, most other tournaments tend to lack PED testing. A spinal lock is a multiple joint lock applied to the spinal column, which is performed by forcing the spine beyond its normal ranges of motion. This is typically done by bending or twisting the head or upper body into abnormal positions. Commonly, spinal locks might strain the spinal musculature or result in a mild spinal sprain, while a forcefully and/or suddenly applied spinal lock may cause severe ligament damage or damage to the vertebrae, and possibly result in serious spinal cord injury, strokes, or death. Spinal locks and cervical locks are completely forbidden from gi Jiu-Jitsu, amateur MMA, multiple forms of no-gi Jiu-Jitsu, Judo, and other martial arts. Due to its illegal nature and express purpose to cause serious, irrevocable bodily injury, paralysis, and death, its use both inside and outside of the gym can constitute aggravated assault. The forceful application of chokes such as the Rear Naked Choke and subsequent cranking of the neck whilst being choked can potentially lead to arterial dissection, which could lead to stroke. Due care should be exercised when applying these chokes in sparring situations. ^ "Luiz Franca". Bjjheroes.com. Retrieved 5 March 2019. ^ a b "Who was Oscar Gracie and who taught him Jiu-Jitsu". Global-training-report.com. Retrieved 5 March 2019. ^ a b c Edward, Chad (October 30, 2007). "Untangling a sport that transcends style". The Cincinnati Enquirer – via azcentral.com. ^ Eros, Rildo. "História do Judô". Archived from the original on 2009-02-10. ^ "Team Conde Association". bjjteamconde.com. Archived from the original on 2012-03-30. ^ "Top 30 Myths and Misconceptions about Brazilian Jiu-Jitsu". Global-training-report.com. Retrieved 2018-11-04. Every aspect of early modern BJJ was already being trained and taught as early as 1905 in the USA and England. ^ "Mitsuyo Maeda & Luiz França". Equipemestrewilson.com (in Portuguese). Archived from the original on October 4, 2013. Retrieved August 15, 2013. ^ "Oswaldo Fadda". BJJ Heroes. Retrieved 2015-11-20. ^ "What is Jiu Jitsu". BJJ Heroes. Retrieved 2015-11-20. ^ Motomura, Kiyoto (2005). "Budō in the Physical Education Curriculum of Japanese Schools". In Bennett, Alexander (ed.). Budo Perspectives. Auckland: Kendo World. pp. 233–238. ISBN 4-9901694-3-3. ^ "New Jiu jitsu club opens 1930 with director Donato Pires dos Reis". Judo.forumsmotion.com. ^ "Todays "Modern" BJJ Guards Were Used in Kosen Judo Tournaments in 1952". Bjj-world.com. December 20, 2017. ^ R.H. Marcus (23 October 2012). "KOSEN JUDO (not today's Olympic Judo) - Vol. 1". YouTube. ^ Red Dragon Diaries (5 August 2016). "Kosen Judo Class at Kyoto University (Foundation of Modern BJJ)". YouTube. ^ Trixthor (7 April 2008). "Judo - Hairi Kata (sweep) - Kashiwazaki". YouTube. ^ JudoMateo (9 November 2012). "Hirata Sensei Kosen Judo half guard passes". YouTube. ^ "Kosen Judo vs. BJJ". Grapplingmastery.com. 22 January 2015. Retrieved 5 March 2019. ^ a b c d "Rule Book : English Version" (PDF). Ibjjf.org. Retrieved 2015-11-20. ^ a b "Association of Boxing Commission : Amateur Mixed Martial Arts" (PDF). Abcboxing.com. Retrieved 2015-11-20. ^ a b "Refereeing Rules 2011-12" (PDF). Intjudo.eu. Retrieved 2015-11-20. ^ a b "Rules". US Grappling. ^ Clifton, Paul (December 1997). "Carley Gracie - The Lion of the Gracie Family!". Combat. Vol. 23 no. 12. Birmingham, UK: Martial Arts Publications. Retrieved 5 September 2018. ^ "Rorion Gracie". Gracie Academy. Retrieved 5 September 2018. ^ Mejia, Zameena (5 December 2018). "Ex-Navy SEAL commander: Here's why so many smart people practice Brazilian jiu-jitsu". Cnbc.com. ^ "International Brazilian Jiu-Jitsu Federation – Rule Book" (PDF). Official IFBJJ rules, see Article 5 – Fighting Conclusions, The order of the referee, subsection – E. Retrieved June 10, 2010. ^ Dzabirski, Ognen (26 March 2018). "Versatile Attacks From The BJJ North-South Position". Bjj-world.com. Retrieved 5 March 2019. ^ "Having Problems Understanding Deep Half Guard? Jeff Glover Presents "Uncle Richard Guard"". White Belt Brazilian Jiu-Jitsu. 2017-04-13. Retrieved 2018-09-18. ^ a b Gracie, Renzo; Gracie, Royler (2001). Brazilian Jiu-Jitsu: Theory and Technique. Invisible Cities Press Llc. p. 304. ISBN 1-931229-08-2. ^ "16 Jiu-Jitsu Practitioners That Were Promoted Straight to Black Belt". bjjee.com. 2015-10-14. Retrieved 2017-02-01. ^ Guillaume, Huni (2015-09-10). "Top 10 Fastest Black Belt Promotions in Brazilian Jiu-Jitsu History". bjjee.com. Retrieved 2017-02-01. ^ Fábio Santos. Passion makes him a champion. ^ Ryron Gracie (March 2014). Ryron Gracie of the legendary Gracie Clan. Beverly Hills, California: plugonetwo.com. ^ "Rose Gracie honors MMA roots with overhaul of Gracie U.S. Nationals – Loretta Hunt – SI.com". Sportsillustrated.cnn.com. Retrieved 2014-02-17. ^ "Polaris Pro - The Aftermath - Attack The Back". Attacktheback.com. Retrieved 2016-05-17. ^ Scoggin, James F.; Brusovanik, Georgiy; Izuka, Byron H.; Zandee van Rilland, Eddy; Geling, Olga; Tokumura, Seren (February 2014). "Assessment of Injuries During Brazilian Jiu-Jitsu Competition". Orthopaedic Journal of Sports Medicine. 2 (2): 232596711452218. doi:10.1177/2325967114522184. PMC 4555620. ^ Kreiswirth, Ethan M.; Myer, Gregory D.; Rauh, Mitchell J. (January 2014). "Incidence of Injury Among Male Brazilian Jiujitsu Fighters at the World Jiu-Jitsu No-Gi Championship 2009". Journal of Athletic Training. 49 (1): 89–94. doi:10.4085/1062-6050-49.1.11. PMC 3917302. PMID 24377959. ^ "BJJ Safety". Uiowa.edu. Archived from the original on 2011-11-08. Retrieved 2011-09-15. ^ : Equipe Brasa : : Brasa team : Brazilian Jiu Jitu :. "Black belts united against steroids in BJJ. Do you want to join it?". Brasa.brazilianblackbelt.com. Archived from the original on 2012-11-02. Retrieved 2013-03-30. ^ Erin Herle (January 23, 2013). "Drug Testing Makes its Way to Jiu-Jitsu Competition". Graciemag.com. Retrieved April 11, 2013. ^ "Attorneys – Long Island, New York Lawyers – LBC&C". lbcclaw.com. ^ Killer Move the Wigan Grobbit. YouTube. 19 February 2007. ^ Demartini Jr, Zeferino; Freire, Maxweyd R.; Lages, Roberto O.; Francisco, Alexandre N.; Nanni, Felipe; Gatto, Luana A. M.; Koppe, Gelson (June 2017). "Internal Carotid Artery Dissection in Brazilian Jiu-Jitsu". Journal of Cerebrovascular and Endovascular Neurosurgery. 19 (2): 111–116. doi:10.7461/jcen.2017.19.2.111. PMC 5678212. PMID 29152471.
International Brazilian jiu-jitsu Federation, Retrieved 2010-10-12. The History of BJJ Retrieved 2018-10-01.